As the story looks dire and the momentum begins to build for the conclusion of this six-issue crossover, the “He-Man/ThunderCats” creative team managed to turn in the most entertaining installment to date. 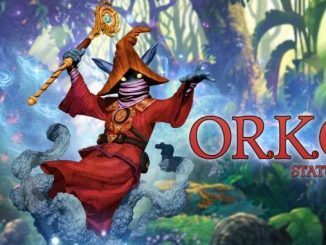 When we last left Eternia, Skeletor and a now-incorporeal Mumm-Ra joined forces and, with a few tricks from the Golden Discs of Knowledge, managed to enslave Third Earth’s Ancient Spirits of Evil. As they attack the city of Eternos, the ThunderCats pledge to aid King Randor and the Masters of the Universe however they can. 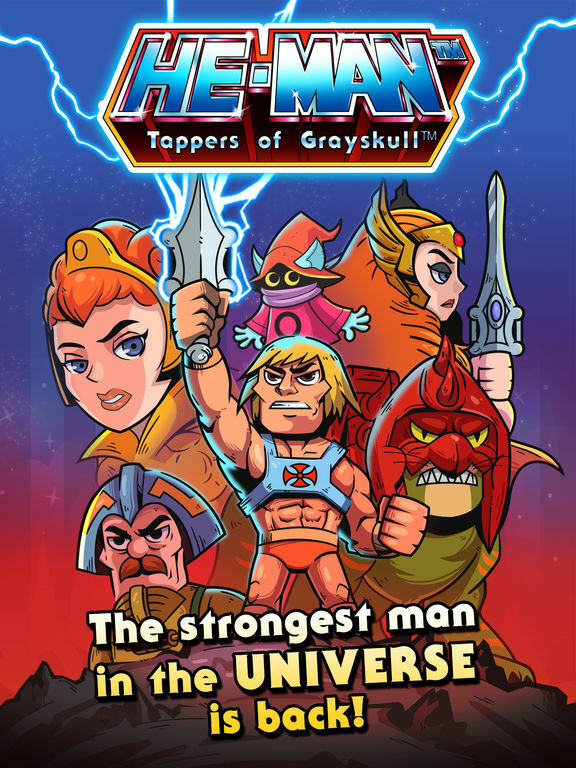 Still, the odds are stacked against them – He-Man, the most powerful man in the universe, is dead. Lion-O and Cringer set off on a daring mission to bring him back to life, and the ensuing story is full of surprises, action, and breathtaking artwork. While the team of Williams and Colwell have always turned in fun, bright, energetic pages, “He-Man/ThunderCats” #4 is definitely their high point. Their figures’ body language is emotive, the movements fluid, and they give their fight scenes a grand, super-powerful scope you don’t see in most comic books. This issue delivers one of the fundamental promises of these sorts of crossovers – the big fight between our heroes. 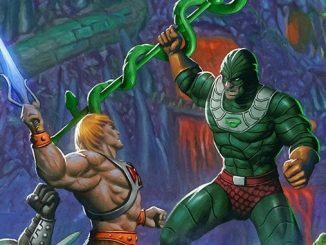 He-Man versus Lion-O! 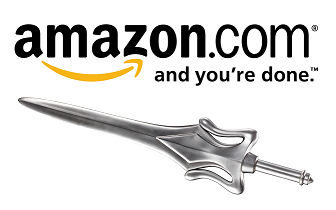 The Power Sword versus the Sword of Omens! The battle is likely what attracted many readers in the first place, and it doesn’t disappoint in the slightest. David and Goldfine continue the use of caption boxes by speakers unnamed until the issue’s end, but this one is easier to guess than others. Their writing is slick and, with the exception of Lion-O’s speech during his fight with He-Man, a bit on the sparse side. 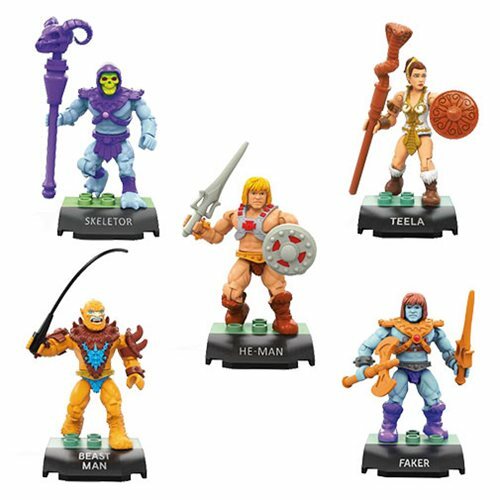 Supporting characters like Panthro and Man-At-Arms are each given a line or two of dialogue, but most are not seen at all. 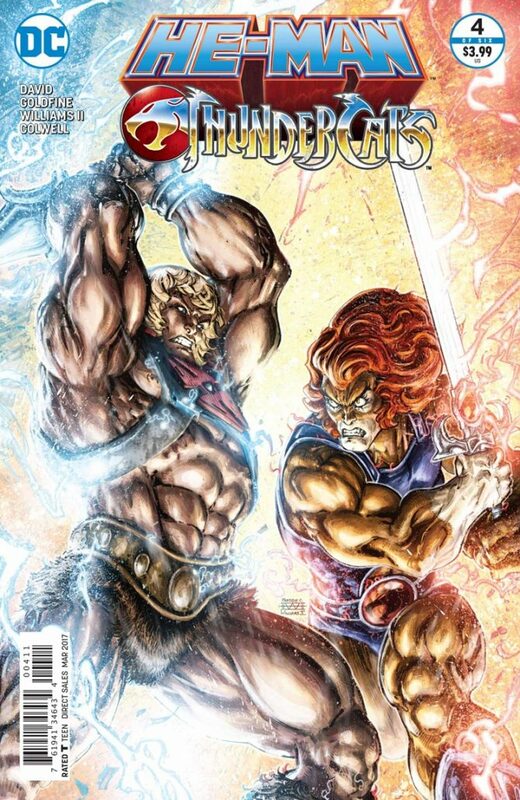 While the ThunderCats were all given some time in the spotlight in issue #3, most of the Masters of the Universe have barely appeared in the series. With two issues left before the conclusion, it’d be nice if we got to see more characters doing more things. 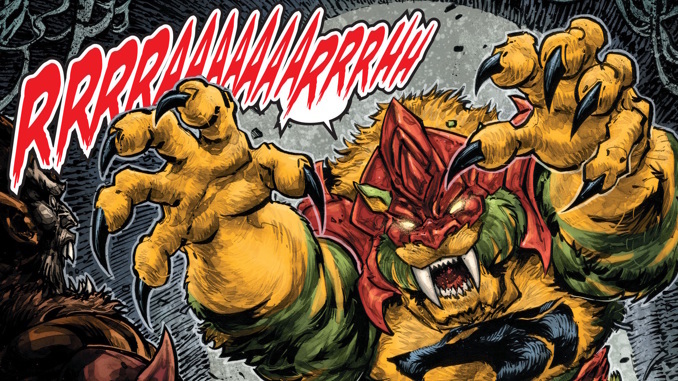 “He-Man/ThunderCats” #4 is the strongest issue of the crossover miniseries yet. It provides all the thrills fans have been expecting, and with any luck, it’s a sign that the series will end on a similarly crowd-pleasing note. 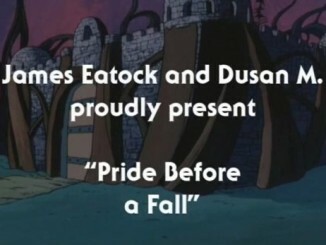 The Official He-Man and the Masters of the Universe Youtube channel presents an early comedy track – “Pride Before a Fall”.